At TellusFashion, it’s time to get your dirty clothes and loose change together with just half a cup of detergent and set the washing machine to just 30 degrees. 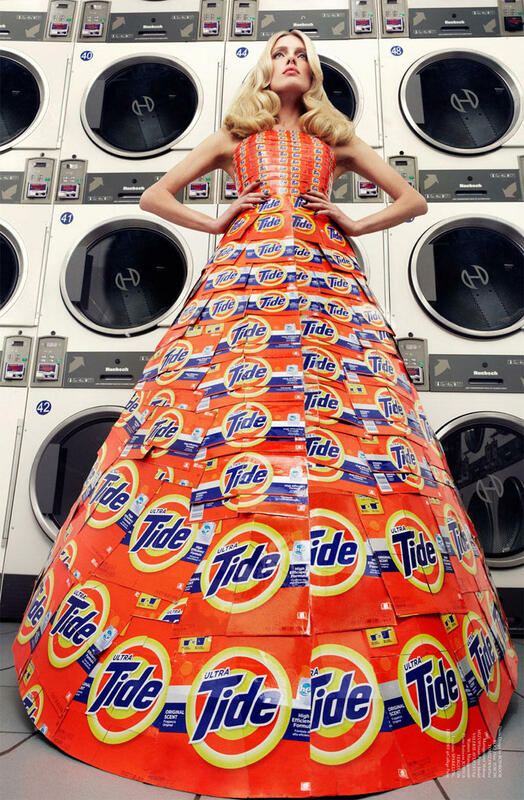 Virgine magazine has picked up on the laundry inspired trend with this unusual yet creative dress made from Tide boxes worn by Valerie Avdeyeva and styled by Hissa Igarashi. This concept has been done before in 2005 when US Vogue featured Lily Donaldson, Caroline Trentini and Gemma Ward getting their weekly washing done at their local laundromat while wearing some gorgeous dresses styled by Edward Enninful . They end up causing havoc when a soap avalanche emerges and takes over the place. Paris Hilton sorted out her delicates during her visit to London in the June issue of Tatler in 2009. Washing clothes will never be the same again.